A Samurai of the Bakumatsu period. Master of the 北辰一刀流 Hokushin Ittoryu School of Swordsmanship. He studied with his father, 千葉周作 Chiba Shusaku, and became so proficient, he was called "Small Tengu" at age 19. The Mineoka Mountain District ( 嶺岡山地 Mineoka sanchi). Mount Mineoka Asama is 336 m high. On its North-Eastern side is a temple housing 白滝不動 Shirataki Fudo and the stone Tengu masks are close to it. 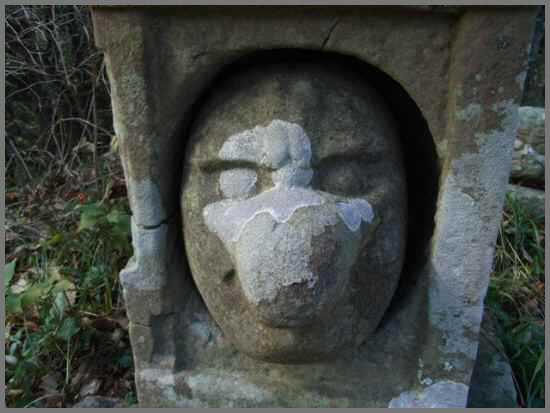 The stone Tengu on the way have some strange forms, with a protruding mouth and a nose like a dumpling. 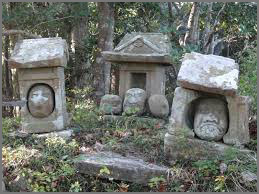 The locals call them 石尊山 Sekison San - Venerable Stone Deities . 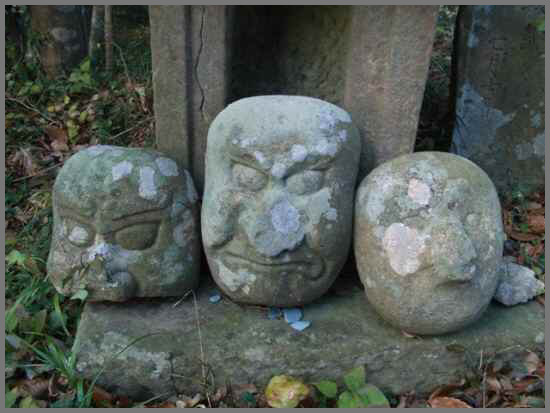 There are three sanctuaries for the stone Tengu on the way up to Mount Mineoka Asama. 石尊様 Sekison Sama are also venerated in Gunma, 甘楽郡 Kanragun 南牧村 Nanmoku village.
. . . CLICK here for more Sekison Photos !
. Tengu Legends from the Tanzawa mountains . From its peak there is a great view over the Kujukutani mountains, Tokyo Bay and all the way to Mount Fujisan. Now the center of 県立高宕山自然公園, Takagoyama Prefectural Natural Park in South-central Chiba. 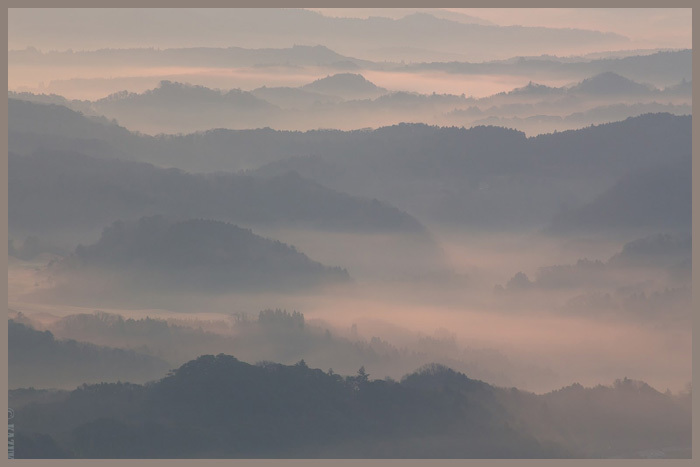 Kujukutani is the landscape of the row of mountains seen from the Kujukutani Park down from Shiratori Shrine at the southeastern end of Mt. Kano in Kimitsu City, Chiba Pref. The mountains including Mt. Takago are part of Boso Kyuryo (hills). This picturesque landscape is composed of deep valleys and overlapping mountain ridgelines, which is selected as one of 500 Charming Spots in Boso. Purple mists at dawn or the after grow of a sunset creates a magnificent scene like an ink painting. Especially beautiful is the sea of clouds trailing along the ridgelines and fading out into the air, which can be seen from the late fall to winter. Mount Takagoyama is 雨乞いの山 a mountain for rain rituals. At 清滝神社 Kiyotaki Jinja a small shrine the Waterfall Deity is venerated as 高オカミ神 the Mountain Deity. Below this shrine is the Kannon hall in a cave, protecting the Tengu masks. Once upon a long time, Minamoto no Yoritomo had to flee from 小田原の石橋山 the lost battle in Odawara and took refuge here. Yoritomo stayed in the Kannon cave (高宕観音 Takago Kannon) and prayed for the return of his good luck and victory. On the pillars of this cave-hall hang the Tengu masks. 高宕山 The Kanji in the middle, 宕, refers to the cave, and this reminded people of the famous 愛宕山 Atagoyama in Kyoto. Maybe the Tengu from Atagoyama even came here to visit ? ??
. amagoi 雨乞い rain rituals - Introduction . Iizuna temple is known as the 天狗の寺"Tengu Temple". People come here to pray fpr fire prevention, safety on the sea, prosperous business and health. 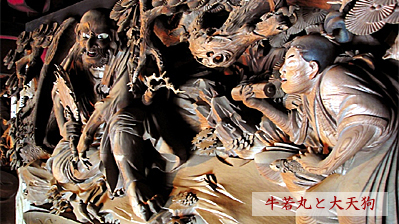 The temple treasure is a wood carving of about 4 m length and 1 m hight by the famous carver 波の伊八 Nami no Ihachi. 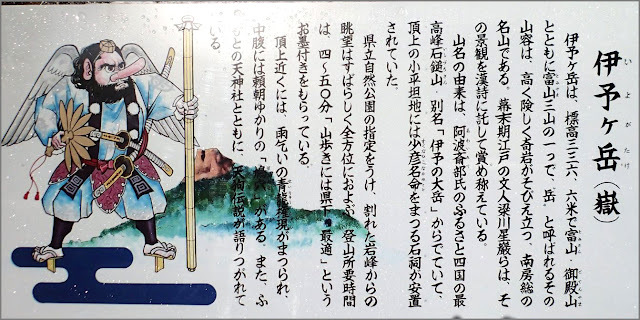 It shows 牛若丸と天狗 Ushiwakamaru and the Tengu. At the 仁王門 Nio-Mon entrance gate is a carving of a Tengu riding the waves.
. Iizuna Daigongen 飯縄大権現 Izuna Daigongen .
. 飯綱三郎天狗 Izuna Saburo Tengu . He lives on Mount Iizunayama 飯砂山 / 飯綱山 in Nagano. 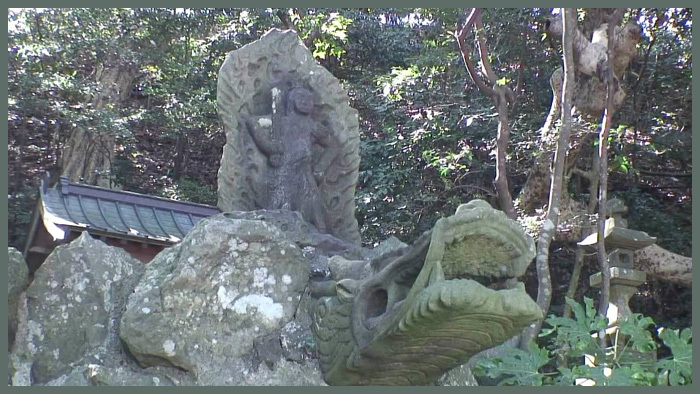 Dragon and waves　竜と波 at temple 飯縄寺 Izunadera. Once there were two brothers, but the younger brother suddenly went off and was lost. Afterwards a typhoon begun to blow and from the top of a cedar tree the voice of the man was heard "I am back, I am back!" He had become a guhin 狗賓 Tengu and is still living to our day. 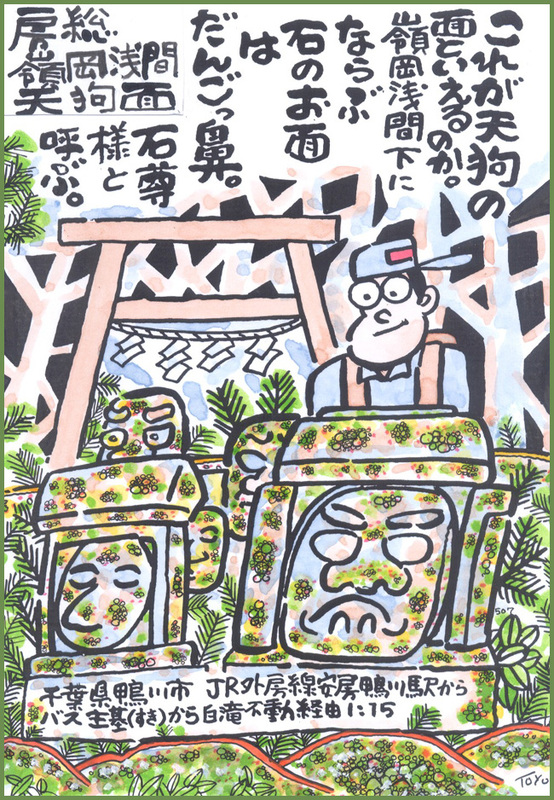 Someone cut the weeds below the 天狗の腰かけ松 Pine of the Tengu. 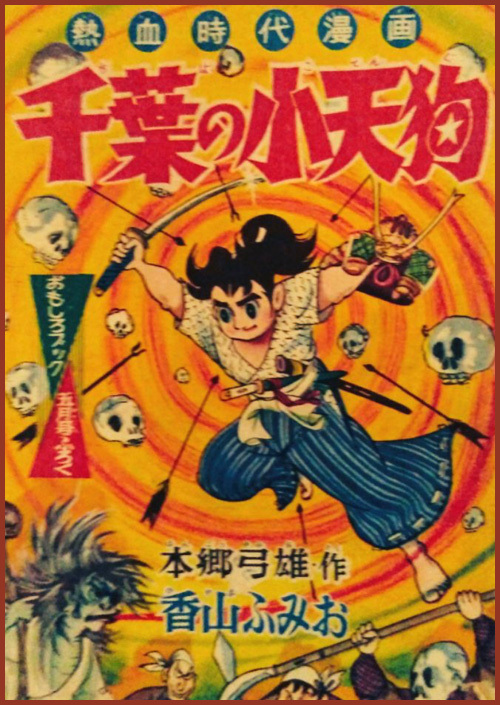 The Tengu got angry, abducted him and when the man came back, he had a bad injury.
. Tengu no koshikake matsu 天狗の腰掛松 / Tengu no matsu 天狗の松 . Aoso sama 青麻様 "Green Hemp Deity"
The protecting deity of the 鹿間家 Shikama family is Aoso Sama, said to be a Tengu. He protects from 中風 palsy. Its annual rituals are on the first of April and September. The offering is red rice and never pumpkin or leek, since he does not like these vegetables. A child once saw a Tengu on the bridge of 東茂原 Higashi Mobara. Soon after the child got ill and died. A Tengu once shape-shifted and worked at a temple in I市原 chihara town. When the priest asked him to get some Tofu he flew all the way to Kyoto to buy it. Many Tengu sometimes came to the 権現森 Gongenmori Park and made music with flutes and drums. At 滝田 Takita there is 天狗の通り道 a Tengu road, where they pass with the most strange sounds when flying past. It is a rather deep forest and sometimes the forest workers, who stay over night in a small hut, can feel it moving and shaking.
. madoo 魔道 - まどう Mado, road where monsters pass . 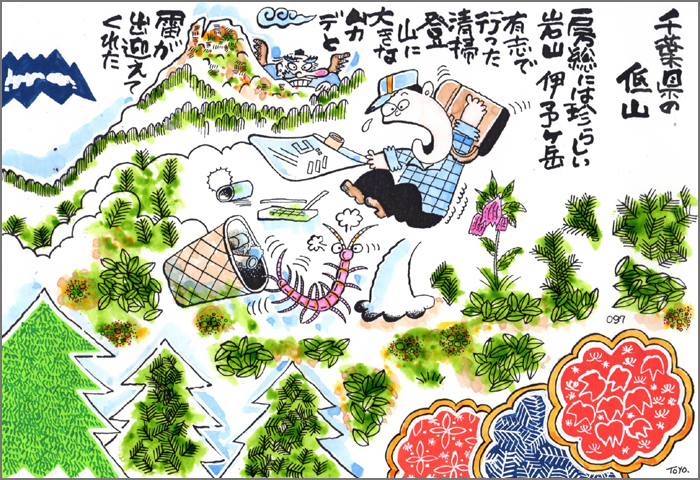 A villager from 八束村 Yatsukamura village has seen a Tengu in the mountain forest, reading a book. On mount 伊予ケ岳 Iyogatake in the village 平群村 Hegurimura near 岩井 Iwai there lived a Tengu. The warden of the small shrine could tell his temper: On good days the water bucket was filled by the Tengu, on bad days it was empty. Mount Iyogatake (伊予ヶ岳 Iyoga-take) is a mountain on the border of the city of Minamibōsō, Chiba Prefecture, with an altitude of 336.6 m (1,104 ft). Mount Iyogatake is at the west of the Mineoka Mountain District of the Bōsō Hill Range, in close proximity to Mount Tomi. 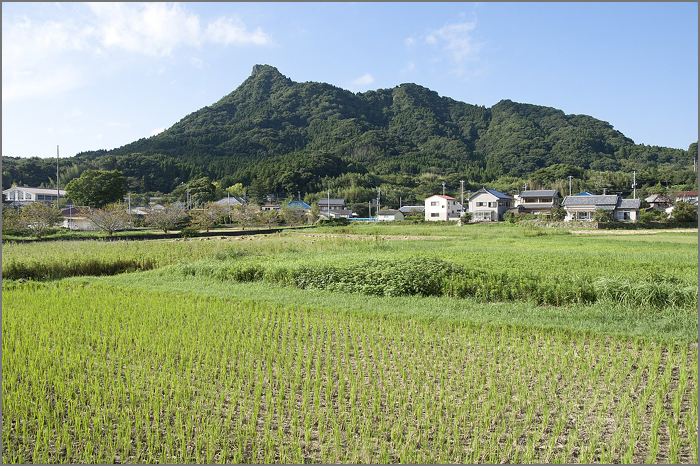 The mountain takes its name from its resemblance to Mount Ishizuchi in Ehime Prefecture, formerly in Iyo Province. Mount Iyogatake is one of the few mountains in the Bōsō Hill Range with steep rock cliff. It can be easily climbed within 40 minutes. The entrance to the path of the mountain is between Heguri Elementary School and the Heguri Tenjin Shrine. Mount Iyogatake offers a clear view of the other mountains of the Bōsō Hill Range and Tokyo Bay, and on clear days Mount Fuji and the Izu Islands are also visible. 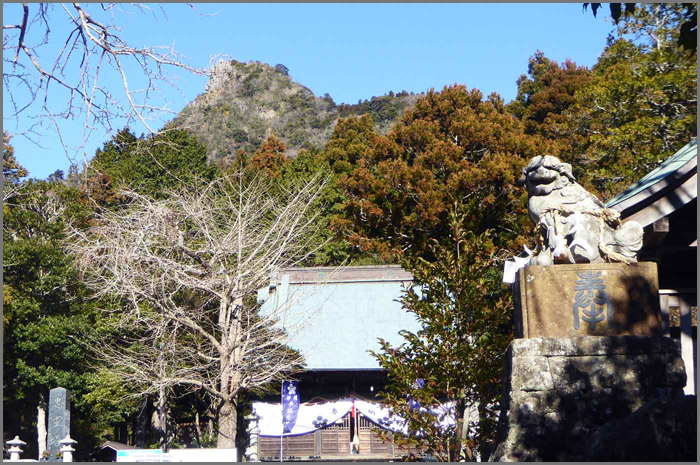 Mount Iyogatake and the Heguri Tenjin Shrine are associated with a legend of a tengu, a supernatural creature found in Japanese folklore. "Tonight at the full moon, bring the most beautiful girl of Heguri village to the Shrine 天神社 Tenjin Sha at the foot of Mount Iyogatake. If you do not obey, I will use my 天狗の団扇 Tengu fan and blast away your whole village in a storm!" "If the Tengu will use his fan, we can use our own fan to teach him a lesson!" 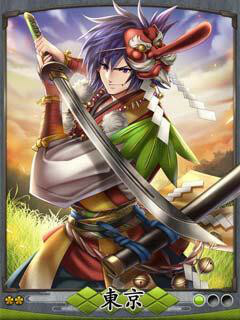 He made a fan three times bigger as the one used by the tengu, climbed Mount Iyogatake and showed it to the Tengu. The Tengu wanted to have it and exchanged it for his own. When he next tried to use the new fan to fly down to the village, he fell from the mountain - he had lost his 神通力 magical power. 定さん Sada san. Sada san was the second son of a rich farmer. Sada san had once picked up the fan of the Tengu on the foot of the mountain and brought it back. The Tengu was very greatful and invited him for a delicious meal. 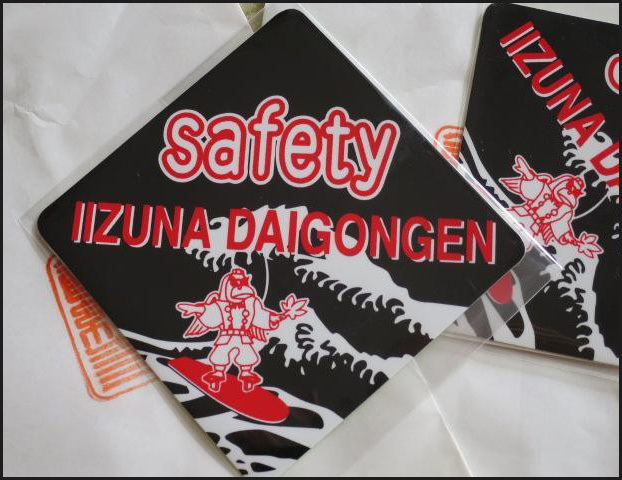 As you know, a Tengu needs his fan to be able to fly around in the sky. The man, who knew the others did not like the Tengu, was glad he had given the fan back and received a meal instead, so the two became friends. The man went up to the Tengu's living quarters many times to eat and tell all in the village about his new friend. Thus he helped to make the Tengu quite famous . . . to our day, it seems. "I can fly to all the way Shikoku to 像頭山 Mount Zuzu-San and the temple at 金琴平山 Konpira-San and come back in no time at all!" Sada doubted this, but the Tengu wielded his fan and slowly disappeared in the sky. Since he did not come back, Sada san went home to sleep. When he opened the shutters next morning he saw an amulet from the famous temple at Konpira San on his doorstep. This must have been placed there by his friend, the Tengu. 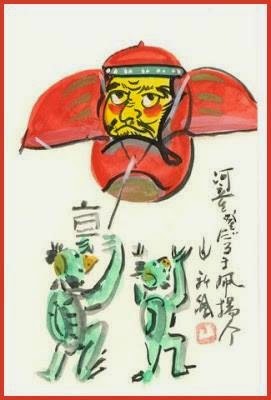 Once upon a time, the Tengu from Iyogatake abducted an acolyte, the son of 小松民部正寿 Komatsu Minbu Masatoshi, from the temple 小松寺 Komatsu-Ji in 千倉 Chikura and much later they found the boy at Iyogatake. Once in summer during the rainy season, villagers were cleaning up the mountain. When they emptied a trash box on the wayside, a large mukade ムカデ centipede came out of it. 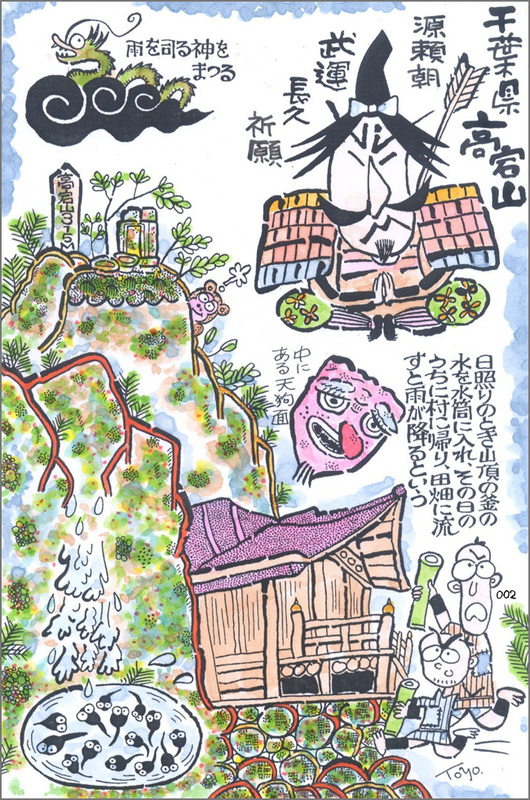 Stories about a Tengu living on this mountain date back to 921 and the curse of Sugawara no Michizane. This shrine was founded in 1353, when collecting money for the 北野天満宮 Kitano Tenmangu Shrine. Later in 1586, it was rebuilt on orders of the local lord, 里見義頼 Satomi Yoshiyori (1542 - 1587). Later in 1808, it was rebuilt by priest 法印宥弘. 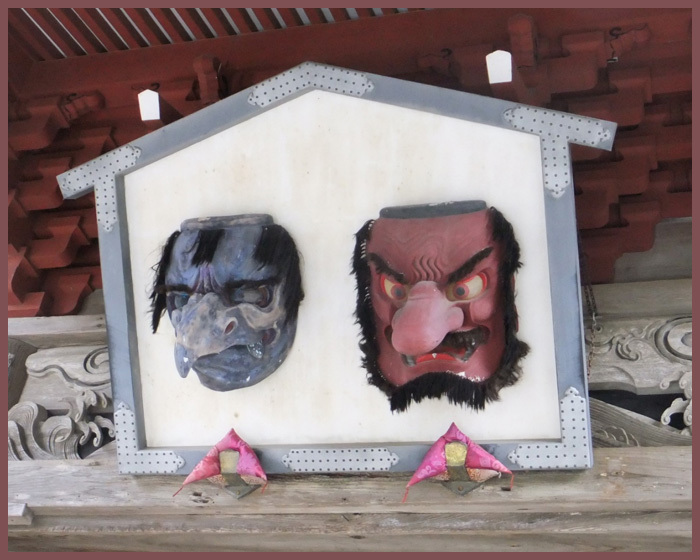 It was the protector shrine of the 9 villages comprizing Heguri, but during the Meiji restauration it lost its power.
. Sugawara Michizane　菅原道真 - Tenjin Sama .
. Tengu no men 天狗の面 / 天狗面 mask of a Tengu - Introduction .